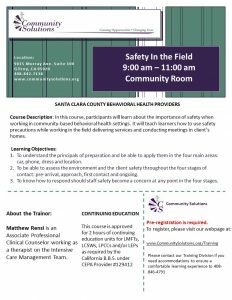 In this course, participants will learn about the importance of safety when working in community-based behavioral health settings. It will teach learners how to use safety precautions while working in the field delivering services and conducting meetings in client’s homes. 1.To understand the principals of preparation and be able to apply them in the four main areas: car, phone, dress and location. 2.To be able to assess the environment and the client safety throughout the four stages of contact: pre-arrival, approach, first contact and ongoing. 3.To know how to respond should staff safety become a concern at any point in the four stages. CEUs: This course is approved for 6.5 hours of continuing education units for LMFTs, LCSWs, LPCCs and/or LEPs as required by the California B.B.S. under CEPA Provider #129412. If you need special accommodations to ensure a comfortable learning experience please contact our Training Division.